I don’t think I’ve read a more unbelievable statistic. Can Bloomberg really only use FOUR people to generate one of the most watched oil estimates in the world—a number that moves billions of dollars each week? A report from Canadian brokerage firm RBC Dominion two weeks ago suggests that that is what happens sometimes. Maybe their report, titled “Oil Strategy: The Tale of the Tourist” helps us understand some of the crazy volatility around oil prices in the last year. Bloomberg consensus estimates come from a survey of market participants compiled by Bloomberg. The survey estimates crude, gasoline and distillate storage for the week, as well as the change in storage at the Cushing terminal. Bloomberg consensus estimates are used by most market participants to help judge whether the weekly EIA crude storage report is a beat or miss. It is taken for granted that the consensus compiled by Bloomberg constitutes a fair representation of the overall market’s expectations. Yet—maybe not. RBC says the number of participants in the survey is often astonishingly low. RBC describes how the Weekly Cushing Inventory Survey is, at times, based off as few as 3 analyst estimates. Similarly, the Weekly Crude Inventory Survey is often based off of 10 or fewer participants. On April 11th, for example, RBC noted that just 3 participants provided estimates for the Cushing survey. The average, or mean, which is generally taken as market consensus, was for crude storage of 400 kb. The mean of this data was derived from three estimates of 0 kb, +100 kb, and +1,100 kb. When the actual storage number of +276 kb was announced, it was digested by the market as “smaller than the consensus build’ and therefore a bullish beat. Given the context, investors have to ask if this response was appropriate? First, there were only 3 estimates. Second, of those 3 estimates, two were actually lower than the storage number announced. Third, because one of the estimates was so much larger than the others (1,100 kb), it dominated any calculation of a mean. The Cushing survey is commonly done with 5 or less participants. The weekly crude survey is routinely less than 10. I find that really odd—again, such an important number that moves billions of dollars, based on the ideas of a very few people. Another interesting finding from the RBC study was the difference between participants. 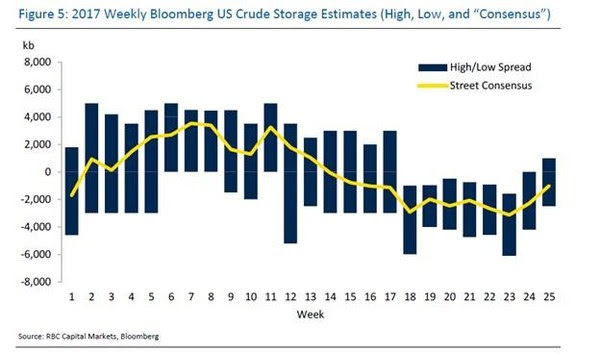 For example in the Weekly US Crude Storage survey there are many weeks where both the high and low estimates are more than 2,000 million barrels off of the mean. RBC provided the following chart to illustrate how far the individual survey estimates have varied from the mean over the course of 2017. You expect a wide range when you have dozens of people guessing. But when it’s from only 8-10 survey participants—just how relevant the “mean” of that data really is? If individual estimates are SO far apart, what is the value of their average? A mean assembled from only a few data points and with a wide dispersion has limited statistical significance. Can it be said to represent a true consensus of the overall community? Yet traders judge the weekly EIA data within the lens of the Bloomberg survey consensus. A small beat or miss can be significant to the short term fluctuations of oil. And with the rise of “non-commodity traders” and “near extinction of pure-play energy hedge funds”, RBC argues that these sorts of fluctuations have only grown more pronounced of late. It’s tough to say how important this finding is, as no other media has picked up on it. But this could be A Big Deal. Consensus estimates are a key anchor used by investors to interpret the weekly crude stock data. If these tools are misleading they will lead to irrational price swings, which is then amplified by “tourist traders” unequipped with the experience or knowledge to understand the data and assumption that underlies the headline number. At the heart of the RBC report is the question of whether the oil market is being misled by the data. If such important data is only modestly based on fundamental analysis, from a very (ridiculously?) small group—and it gets used by “the rise of algorithmic funds”, “black box trading” and tourist traders, it appears that there is a case to be made that it is. RBC began by arguing that oil traders have become “headline driven”, that participants in today’s oil market operate with a “knowledge gap” and that they are therefore prone to overreact on headlines and less likely to base their decisions on “detailed analysis of supply, demand and shipping logistics” than their predecessors. The report goes on to highlight two instances of where “the headline numbers” may be misleading to such participants: Bloomberg’s consensus estimates and the American Petroleum Institutes Cushing storage estimates. It is the former that is of particular interest, given the degree to which is shapes market sentiment.